MANILA, Philippines - Lawyer Ferdinand Topacio has confirmed the death of Maguindanao massacre suspect Andal Ampatuan Sr. on Friday evening, July 17, 2015. He was 74 years old. "It saddens me to inform the public that former Maguindanao Gov. Andal Ampatuan Sr. has passed away just a few minutes ago," Topacio said in an interview with GMA News. A report from ABS-CBN News said that the patriarch of the Ampatuan political family in the island of Mindanao passed away around 10:02 p.m.
On Monday, Ampatuan has suffered heart attack which caused comatose. He is also battling to advanced stage liver cancer and being treated at the National Kidney and Transplant Institute in Quezon City before the multiple health implications. The lawyer also announced that Ampatuan's death "will be treated in accordance with Islamic custom and the family of the former governor has requested privacy in their moment of bereavement." Datu Yasser Ampatuan, nephew of Ampatuan said a funeral is being prepared in their hometown in Shariff Aguak in Maguindanao. Ampatuan Sr. is one of the suspects in the Maguindanao massacre that claimed the lives of 58 individuals, including 32 journalists. Private prosecutor Nena Santos says despite Andal Ampatuan Sr.'s death, "the murder case will continue as to the other accused. Ampatuan's sons, Zaldy Ampatuan and Andal Ampatuan, Jr., are both members of his political clan. 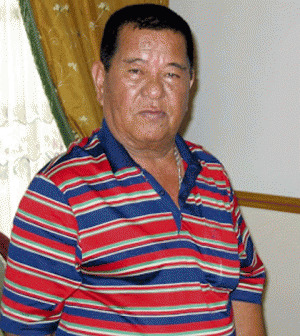 Andal Ampatuan Jr. came to international attention in November 2009 as the prime suspect in the Maguindanao massacre. As a result, all three Ampatuans were expelled from President Gloria Arroyo's Lakas Kampi CMD political party. Andal Jr. is currently detained at the Philippines' National bureau of Investigation and has been charged with multiple counts of murder after having been arrested on December 2009.